Anneke, Matu and I had a busy afternoon at the Prince of Wales Park stream catching 51 birds of 10 species. All of the birds were new which was a bit disappointing, I had hoped to get a few recaps. Birds caught were 4 Starling, 11 Greenfinch, 15 Goldfinch, 1 Dunnock, 1 Yellowhammer, 2 Chaffinch, 5 House Sparrow, 8 Silvereye, 1 Fantail and 3 Tui. One of the Greenfinch had unusual plumage with yellow and cream feathers especially on its head and back, it almost looked like it a bit of Canary. The Greenfinch with odd plumage. The banding station is on the side of a public park and a feature of the day was the number of interested people that took time to look at what we were up to. Included was a father and son who were neighbors of ours who had moved yesterday to a house next to the park and were out exploring the area. Henk and I spent a couple of hours this morning at the little stream (at the moment just a few puddles) over the fence from the Zoo. We didn't catch a lot, only 12 birds. All were new, 3 Blackbird, 1 Song Thrush, 1 Silvereye, 4 Chaffinch and 3 Greenfinch. One of the Greenfinch was interesting as it had a dead foot. It looked that it had broken its leg just above the foot with the foot only hanging on by a length of skin and with no blood supply and dying. 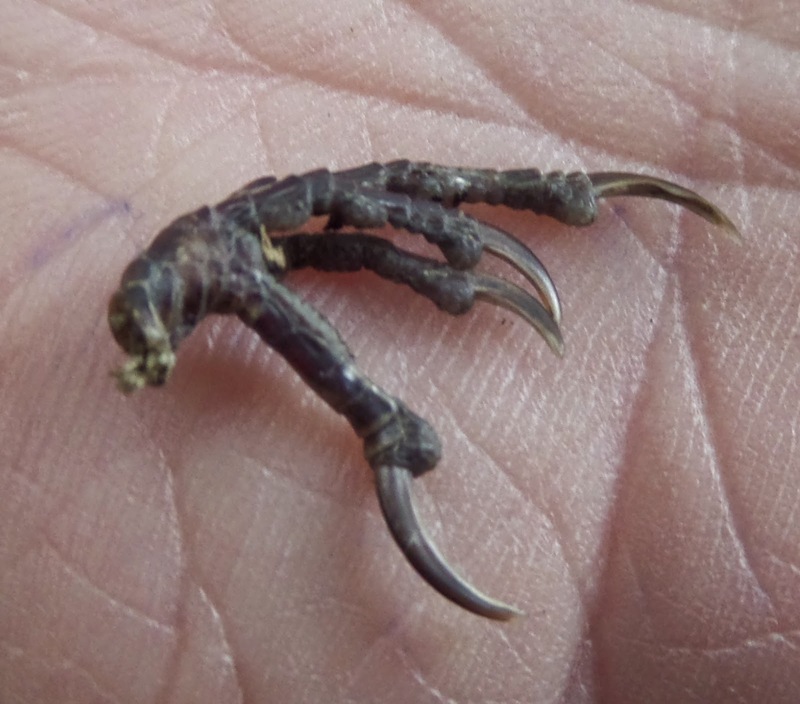 Otherwise the bird appeared to be in good condition with a wing length of 88 mm and a weight of 27.7 g. We removed the foot as it must have been a hindrance. Compare the dead foot with the pink one in the background. I put up a couple of nets this afternoon at the little stream over the fence from the Zoo. I didn't stay very long as the catch rate was slow and then with sun coming onto the nets it got slower. Managed to catch 16 birds of 6 species with 12 new and 4 recaps. The Juvenile Goldfinch with a bird possibly its father. One bird had retained 3 juvenile outer primaries, something I don't see very often. Greenfinch - 5 (2) both the recaps had been banded here at Hornsey Rd, 1 in 2013 and 1 in 2012. Yellowhammer - 0 (1) A bird banded at Newtown Park over the fence on the other side of the Zoo on 19 July 2009. At 1949 days it is now the oldest Yellowhammer recaptured at any site by the Group, beating the old record of 1114 days by a considerable margin. It is the first Yellowhammer we have caught in the Zoo area this year and the first one ever at this time of the year, normally they are winter visitors but perhaps there is a small breeding population in the area. This makes three species that we have recorded our oldest recaptures during the last couple of weeks. We had a very successful session at the Houghton Bay stream this afternoon, catching 76 birds of 9 species with 68 new and 8 recaps. There was a good attendance of banders with Kate, Mary, Ross, Yvan and Sarah, Kyle and little Finn. We also had a number of people who are doing a course on bird recognition. Song Thrush - 2 (0) In 6 years of banding at this site we have only previously caught 4 so 2 in a day is exceptional. Chaffinch - 3 (1) the recap had been banded at the Zoo on 29 December 2005 and is at 3244 by far the oldest Chaffinch we have ever recaptured at any site. The old record was 2574 days held by another Zoo banded bird. Silvereye - 46 (6) 2 of the recaps were banded here at Hornsey Rd and another at the Houghton Valley School and all were banded this year. I set the trap at Bridie's this afternoon for a couple of hours. Didn't catch a big number of birds just 15 of 4 species. Most were recaps that had been banded in the last few years. Did catch D-195041 a Starling banded in Sept 2009 so a reasonably old bird. Then a few minutes later caught D-99970 a Starling that had been banded in Nov 2005, at 3270 days from banding it is now the oldest Starling we have recaptured or recovered at any site. It was originally banded at the Zoo but had been recaptured 3 times over the years at Bridie's, the last in Nov 2012. The five times he has been caught have all been in November. Annette and I had a pretty good session at Island Bay this morning. We had surprisingly good conditions as the forecast for a strong northerly did not eventuate. Perhaps a bit much sun but not complaining. Our catch was affected by not being able to use our usual net site due to a Blackbird putting her nest in the wrong place but we managed with a new configuration. Blackbird - 13 (4) among the recaps was a bird described as having been scalped when banded in Dec 2012, it now appears to be normal. House Sparrow - 24 (5) there were 2 juveniles among the catch the first for the year. The first juvenile Sparrow banded this spring. Silvereye - 1 (1) When I arrived home there was an e-mail from the Banding Office with a report of a recovery of a Silvereye banded in July 2005 at 3406 days from banding it is our 5th oldest Silvereye. Californian Quail - 1 (0) as far as I am aware this in the first banded by the Group. Technically it wasn't ours as it is not on our permit. It is classified as a Game Bird and comes under the umbrella of Fish and Game. Fortunately I have an arrangement with them and it was able to be banded under their permit. Our first Californian Quail - a very handsome Dude! Ross showing Kenisha a Tui with Kate getting one of her Silvereyes into the picture. Mary our scribe waits in the background. We were joined later by Yvan who brought a very welcome flask of hot coffee. This is the first time Yvan has banded with the group. He is French and is an accomplished bander having done his Phd studies on N I Robin. Yvan with his first Goldfinch. Starling - 2 (0) the first Starling caught at this site this year. Silvereye - 36 (11) the oldest was banded in August 2012 and there were 3 that had been banded here at Hornsey Rd 2 this year and 1 last. Grey Warbler - 3 (0) 2 were juveniles, the first for the year. Kenisha about to release the adult (red eye) Grey Warbler. Tui - 4 (0) Yesterday I went to the Houghton Valley School fair and was presented with a dead Tui that had been found on the footpath outside the school, It had been banded at the stream in Feb this year.